People have been camping since the dawn of time, and you’d think with all that practice we’d be champions at it by now. Despite all this time spent in the wilderness, either for fun or out of necessity on a hunting trip, we still have a lot to learn. 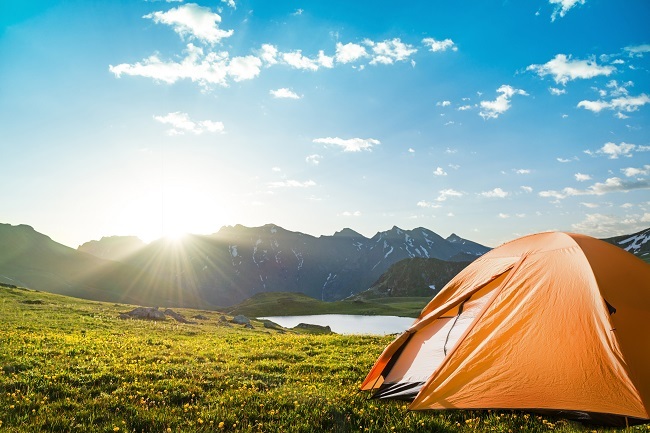 Fortunately, these camping tips & tricks brought to you by Mixer 2 Mower, Life Hack, and BuzzFeed will make your next trek into the wilds just a little easier. There’s nothing like a night around the campfire. The smell of wood smoke, the primal attraction of the leaping flames, and the smell of marshmallows and hot dogs getting cooked to perfection. Unfortunately, there’s also mosquitoes. While the smoke from the fire will keep some of them away, it won’t keep the bulk of these blood drinkers from crashing your party. Unless you use a bit of sage. Just toss some of this useful herb into your fire, and watch as the mosquitoes flit away. You might need to add a little more for long evenings, but the smell is pleasant, and it should add a little spice to your gatherings. Organization is key when you’re camping, and sometimes that organization can come from some pretty unexpected places. For example, if you want to carry a tackle box in your shirt pocket, all you need is an empty Tic Tac box or two. They’re convenient, sturdy, water tight, and you can easily fit line, hooks, and other necessities in them. If you want a way to keep track of all your cooking supplies, then using a hanging shoe cubby (the sort that you can roll up for minimal storage space) is another great solution. Portable sewing boxes, hip bags, and even travel bottles meant for shampoo are great for carrying all your stuff with you. Stack-able pill boxes, and straws, are also ideal for spices and seasoning. In case you’re wondering, those tiny bottles are ideal for condiments, and other liquids you want to bring with. Carrying everything with you can be a burden when you’re camping, and this is especially true if you’re doing it the old-fashioned way by hiking off into the wilderness. If you’re that kind of camper, then you need to save as much space (and weight) as possible. Which is why there’s no reason to carry kindling and food. Just bring some corn chips with you. Seriously. Dry corn chips, especially those with powdered cheese on them already, are quite flammable. If you want to get your fire going, but you don’t have any dry leaves or newspaper, just use a few chips. Then you can eat the rest in front of a warm blaze. If you’re in the woods, then you’re in prime tick territory. If you find that one of these unwanted creatures has burrowed into you, and is chewing away, don’t try to tear it out. That won’t get you anywhere. Instead, take some liquid soap, and cover the tick in it. Then hold a cotton ball over it. The soap will cause the tick to back out of your skin, and you can catch it in the cotton ball for proper disposal. Whether you choose to save the tick so it can be tested for Lyme disease is up to you, but it’s never a bad idea to do that. A popular trick among people dealing with power outages, you can use a headlamp (that is, a flashlight meant to be worn on your head) and a jug of water to create a comfortable lantern. Just strap the headlamp to the jug, with the lamp facing inward, and turn it on. The water diffuses the light, creating a softer glow that lights a bigger area. For more tips and tricks on how to stay comfortable on your next hunting trip, simply contact us today!